Their menu sign said they were using Daiya vegan cheese--which, honestly, didn't mean a thing to me. It didn't say what kind of vegan pasta they were using, but again, it wouldn't have meant much either. I will say I was dubious as to what I was gonna get but as you can see from the picture, it did look like what mac and cheese is usually supposed to look like. I'm not gonna say it knocked my socks off or anything, but I was moderately surprised at the texture of both cheese and noodles. The cheese was appropriately cheesy and there was enough of it that it did have that cheddar flavor, though it was just barely on the side of sticky instead of creamy like you'd be used to. Thus the small drawbacks of not being able to add butter or cream. Still, I could taste the cheese and that was good. The noodles also held up relatively well, though again, right on the edge of being gummy but still holding together. While not al dente like standard pasta, they weren't exactly wet cardboard either. It had squish, it had cheese and from those basic standpoints it was a decent effort. For me it did need a little more flavor--like salt and pepper, fortunately those were around to add. Also it was better to get this warm. As it cooled off, it did lose some of that solid texture that made it not so vegan. Thus, this is a dish best served not cold. I'm not gonna go over that salad it came with, I mean come on, IT WAS SALAD! Mixed greens, cherry tomatoes and red peppers with a light vinaigrette--good enough. Yep, the SO went on a noodle kick of a different variety with this bowl from The Sarap Shop. They were more tent than food truck of the vegan Filipino variety. 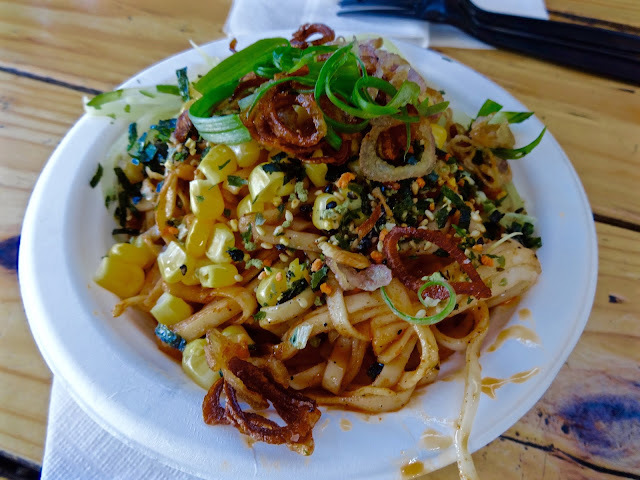 Here we have cold spicy noodles topped with cucumber, corn and crispy fried shallots. The spice on this was nice and bright, giving the bowl a good little kick. Corn was pleasantly sweet and there were plenty of the crunchy onions for texture. This was necessary as these noodles fell flat for me compared with the elbow ones above. These were more pasty and sticky for my taste. Who knows, maybe I was spoiled by the elbow ones from the other dish, but these just didn't work for me. Too bad, it had better flavor and crunch than the mac and cheese but not better noodle. 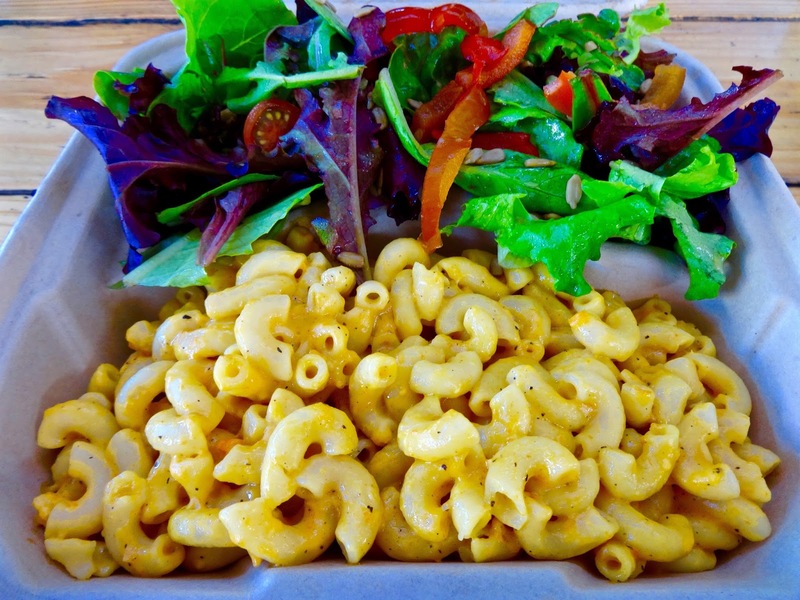 This spicy sauce on the mac and cheese would have been fun. Two different vegan noodle dishes and two different out comes. Both have their good points, but neither was really an aha enough moment to make me want to give up butter and real cheese. Pasta I can let go, but butter? As someone from the South, that's just sacrilege people! Still, outside of the noodles on the second dish, I didn't outright hate either of them and I could see myself getting the mac and cheese again, if I'm there on a vegan day and no other new options are available. What? Too many parameters? Well, I never said I wasn't a picky eater--just ask the SO.